This is important stretch that helps improve your posture, your shoulder mechanics, and even help with neck pain. Start: Stand next to a doorway. Lift your arm to 90 degrees so your palm is on the frame. You can place your arm lower if there is shoulder pain. You should feel a gentle pull on the chest wall. Now twist your body to the outside to increase your stretch. This should be pain-free. Hold for 30 seconds. This advanced exercise is perfect for any throwing athlete. It is a plyometric exercise which means your muscles will exert a maximal effort in a short period of time and is specific to the shoulder. Equipment: small weighted ball of 3-5 lbs. 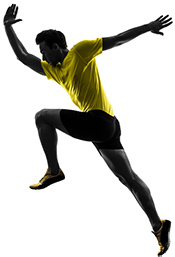 Start: Facing the wall, in a throwing position with your feet separated. Always engage your core. You want to throw the ball into the wall with the intention of getting a rhythm going. You can start with a slow rhythm and gradually increase your pace. Practice for 30 seconds and slowly build to 60 seconds. Start with two hands and switch to single hand as tolerated. This exercise targets the four muscles of the rotator cuff. It is very important to have both strength and stabilization of the rotator cuff muscles to avoid injuries such as impingement and/or rotator cuff tears. Start: Place the rolled towel at your elbow and grab the theraband with both hands. External Rotation: With the towel rolled at your side, keep your shoulder blade down and your wrist neutral. Slowly pull the theraband away from the opposite arm. Avoid pain. Internal Rotation: Anchor the theraband onto an object or in the door jam. With the towel rolled and placed at your side, pull the theraband towards your abdomen. Make sure the band is at the height of your forearm with your elbow is bent to 90 degrees. For both exercises practice for 2-3 sets of 10-15 repetitions. These exercises work the shoulder in three major planes of the shoulder. It is important to keep the elbow straight and shoulder blade down and back. Start: You are going to step on one end of the theraband. Flexion: With your thumb pointing up and shoulder blade down and back, lift your straight arm up in front to 90 degrees. Scaption: You will bring your arm up at a diagonal (in between flexion and abduction) with your thumbs up. Perform each exercise for 2-3 sets of 10-15 repetitions. This exercise is great to build up to a full push up. It allows you to build strength while focusing on your mechanics without infliction of pain. Start: Position yourself near a wall. The closer your feet are to the wall, the easier the exercise. Place your hands directly inline with your shoulders. Keep your elbows in and perform a push up. This will isolate your triceps. You can isolate into your pectoralis muscles buy widening your hands and let your elbows fall out. You can progress by lowering your body to a countertop, then to the floor but your knees down. This is exercise is a progression of the wall push up and requires more scapular stability. It is a great way to a challenge to your daily routine. Start: Place the ball on the wall at chest level and make a diamond shape with your hands. Push up: Keeping your shoulders in a protracted position (shoulder blades away from your spine) perform a push up on the ball. The ball will add increase work as you try to stabilize. Circles: Keeping your hands on the ball, perform small circles along the wall. You will have to shift your center of gravity. Work Clockwise and counterclockwise. A progression of this exercise is to perform this with only one arm. Be sure to keep the elbow straight. A challenging exercise that focuses on shoulder and scapular stabilization. It works all of the muscles of the shoulder girdle and can be very fatiguing. You can perform this exercise on a ball or on the floor with your knees bent. You will start with a light weight in your extended arm. Perform small circles in one direction for 30 seconds, then circles in the other direction for 30 seconds. Next, protract your arm (reaching up so your shoulder blade is off the floor/ball) and perform little circles in 30 second-bouts clockwise and counterclockwise. You want to make sure the motion is slow and controlled. These muscles tend to carry stress and need to be stretched on a regular basis. The muscles that originate on the shoulder blade are the foundation muscles for the entire upper extremity. One of the scapular muscles is the serratus anterior muscle which is an important muscle to keep strong in order to maintain a healthy, stable shoulder. Don't have wimpy triceps! Build up the back of your arms as much as you strengthen your biceps! Old fashion with modern application. We all lift and place objects overhead. This trains for that activity and helps diminish the back injuries that result from weak muscles. It's not named the rotator cuff for nothing...do this rotational exercise to strengthen the muscles that rotate your shoulder. While kind of boring, they're extremely effective. A great exercise for spine mobility and stretch. You will start on your stomach, hands at your shoulders, elbows at your side. Press up lifting your sternum and torso while keeping your pelvis on the floor. Hold for 15 seconds. You should not feel any low back pain. If you do, do not extend up as high. Persons experiencing lumbar-disc issues will often get prescribed "McKenzie back extensions" which is similar; however, you do perform repeated press ups versus holding the stretch. Plus consult with your physical therapist to see if this is appropriate for you. Challenge your push up and add a row. This is a great progression of your standard push up that will add more demands on your core musculature and shoulders. You need two dumbbells of your choice. Start in the push up position with hands holding the dumbbell weights. Perform a regular push up, weight shift to one side and perform a row. Make sure you alternate sides and keep your hips level. To make this harder, perform a push-up windmill. You will perform a push up and as you row turn your hips so you are in a side plank position. Make sure you alternate sides. Repeat 2-3 sets of 10-15 repetitions.